Trace Dynasty, under jockey Omar Reyes, winning the $20,200 Miss Ellen Stakes at Will Rogers Downs Sunday afternoon. CLAREMORE, OK—SEPTEMBER 9, 2018—Heritage Place Futurity(G1) runner-up Trace Dynasty got her first career stakes win on Sunday when she defeated Eye Eye Captain by half-a-length in the $20,200 Miss Ellen Stakes at Will Rogers Downs. Express Train No 9 finished another half-length back to get third. Bouncing off a troubled fourth place effort in the August 19 All American Derby trials at Ruidoso, Trace Dynasty under jockey Omar Reyes completed the 350 yard Miss Ellen course in :17.457 seconds, equaling a 97 speed index into an 8 mph crosswind. Trainer Renee Wilson conditions the Oklahoma homebred by world champion sire FDD Dynasty for owner-breeder Kathleen O. Matey. She is out of the Streakin Sixes mare Wowzer Won. 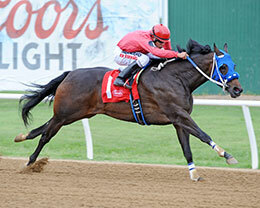 Failing to win in two starts at Remington Park this spring, the bay filly won an allowance at Ruidoso Downs prior to her All American Derby trial. Trace Dynasty has compiled a (11) 3-3-2 record and today's Miss Ellen winners' purse of $11,630 pushes her bankroll over $237,000. Runner-up Eye Eye Captain is a stakes winning son of multiple stakes sire Captain Courage racing for owner/breeder David Clonts and trainer Guillermo Valdivia. Rolando Raudales was aboard the Oklahoma-bred from the Mr Eye Opener mare Eye My Alexis. The two-time Belles Stakes winner entered the Miss Ellen off a second-place effort in the Rocky Heinzig Stakes at Fair Meadows in July. He picked up $4,170 to bring his bankroll to $94,830. Express Train No 9 led early under jockey Cody Smith but had to settle for third earning $2,371. Cosme Velasquez saddled the multiple stakes qualifying daughter of stakes sire Freightrrain B for owner Jessica Perez. Kenneth Norman bred the bay filly in Oklahoma from the Whirling Fastball mare Wildfire Express Two. Jockey Cody Smith was aboard the earner of $68,765. Jc Wild Rose, Hadtoget, Feature Me Gorgeous, Double Eagle, Sr Fly Baby, Jessie Marie and Lil Bit Corona completed the field.